First of all, I want to send well wishes, hopes and prayers to all that were affected by the hurricanes and wildfires. I hope you are all safe and damage is to a minimum. I missed you all last week since my computer crapped out on me. Luckily I have a techy son and he saved everything. I don’t really have any advice on time-saving, as I am just a kitty that chases anything shiny! I did learn a few focus tricks.. Now to put them to use! 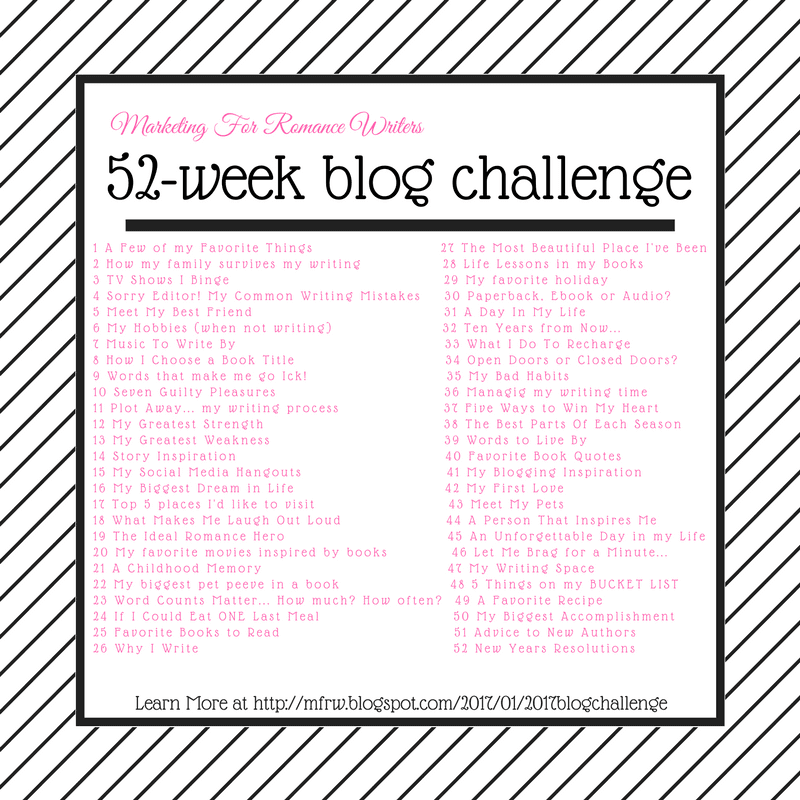 This is week 37 of the 52-week MFRW blog challenge. This weeks topic is Five Ways to Win My Heart. This is in no particular order. Flowers. Not from a shop but potted plants, bags of bulbs potted rose bushes. These keep on giving year after year and not only a few days. I can always clip a few to bring inside. Doing things without being asked. My daughter is spoiling me while she is here. she sweeps, unloads the dishwasher and keeps the laundry caught up daily. My Daughter in law also spoils me by helping me weed, driving me to the store and Dr and helping cook a few times a week. Books. Last year I had an author send me her entire series I had helped promote, beta read and reviewed. I was surprised when that box arrived totally unexpected. I have authors send me free books quite often, and the other day one sent me two audio codes to use for any book I wanted. I would have gotten one of hers but I had them all. so I let her recommend me some. Charm and a kind smile. bay’s giggles, cute kitties and There s nothing like a nice smile, and someone doing something kind like opening doors, passing on favors any act of kindness. I’m a goner! I guess that’s why I love cowboy books so much. Now let’s go see what wins the other author’s hearts. This is a fabulous list of ways to win your heart, Cathy. I love what you said about flowers that keep on giving. I hope your computer is all better. Thanks! My second husband started the tradition of sending me rosebushes to work instead of the traditional dozen roses said it would be more than a dozen and last forever. I loved it! Books and chocolate. Sounds like a great combination. With my kids, doing their chores without being asked is huge. But sadly doesn’t happen very often. 🙁 Yay on a surprise box of books! That is never a bad thing. Good list, and you’re right, that’s so special when people help with cleaning and chores without being asked. We can all use a little kindness. It’s great that your daughter and DIL are so kind and helpful! Thank you they are dolls. What a wonderful, delightful post, Cathy! I agree with all your points of winning favor.